Bold, colourful, and emotive, with a sense of solitude is how I would describe my work. I would say it’s a reflection of my inner character, rather than my outer character and appearance which is much more constant! Why do I paint? Well, I can’t sing or play a musical instrument, and my dancing skills are atrocious! However I do have an urge to be creative and I find that when I am surrounded by paints, brushes, paper and water, and some motivating music in the background, creating an artwork becomes second nature to me and I am compelled to put my heart and soul into each new piece. Watercolour is my choice of medium because it has such a range of possibilities, from gentle, flowing transparency, to thick, bold brush strokes. I often love adding to my paintings with salt, cling wrap, spider web, watercolour pencil, sandpaper, and alcohol (which also doubles as a great way to wind down at the end of a busy day)! 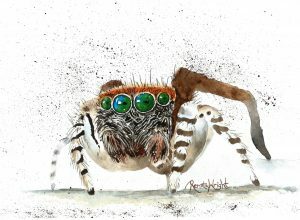 My inspiration right now comes from the 8-legged critters in this world – arachnids! I love to get up close to them and enlarge their faces and bodies so you see them in a different way to the norm. I can imagine that this inspiration won’t go away for a very long time! As with many people, I sometimes hold back on emotions and feelings, so I’m glad to have been given the gift of transferring my emotions into paintings. Painting is a fantastic way to say something without having to use words. The process for me is the best part, rather than the outcome. Every time I put brush to paper or mix a new colour, or draw a new picture in preparation for a painting, I am excited about the journey I am taking, and wondering with great anticipation what I will experience on the way. If you were to ask me who my influence is, I’d say I admire Frida Kahlo – a famous female artist who preferred to paint as she felt rather than what was traditionally accepted. My goal is to do the same – with my own style and influences – and just enjoy being an individual. I don’t see the point of painting something that will please everyone else but not myself. True artists and individuals will understand what I mean.